Over eight hours of mindfulness practices. Earn nine continuing education credits. Healing is a process of coming home to one's authentic self—to the loving presence that is the ground of our being. But we often get trapped by the false refuges of fear-based habits and judgmental thoughts. 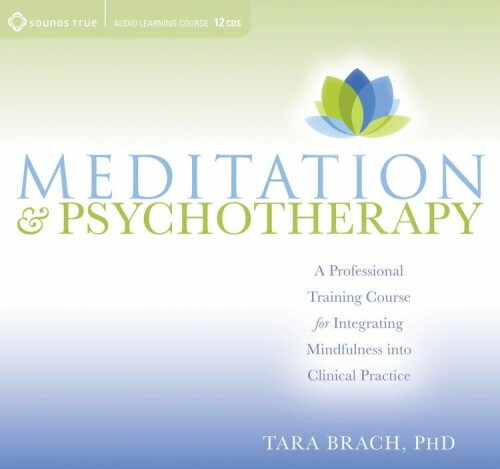 To help us bring the fruits of mindfulness practice into our lives for healing and transformation, Dr. Tara Brach offers Meditation and Psychotherapy. Created for mental health professionals and illuminating to anyone interested in the core techniques, practices, and insights of Buddhist psychology, this experience-focused audio learning program helps us find our way back to natural presence, a place where peace and our deep love for life grows. There are many skillful means that we can use to train ourselves and our clients to become aware, teaches Brach, a psychotherapist and meditator of more than 30 years. But they all lead to one essential question: Can I be here in this moment? Using her R.A.I.N. technique, a four-part process that helps us learn how to stop running away from our tangled emotions and start to lovingly face them, we'll investigate and unblock the beliefs that cause suffering. Guiding us through meditations and practices on mindfulness, loving-kindness, forgiveness, allowing, and more, Brach shares key tools and expert insights for moving through this liberating process so that we can open and allow our lives to unfold, moment by moment. “Mindfulness can strengthen our attention, awaken compassion and empathy, and expand our acceptance of our own inner states,” teaches Brach. Meditation and Psychotherapy draws on the strengths of mindfulness meditation and the practice of modern therapeutic methods to help clear the emotional blocks holding us back. I am recovering from depression and had no interest in meditation or psychology until I began my healing journey three years ago. While this live presentation was originally aimed at psychotherapists, I found the recording to be affirming, inspiring, and educational for me. It helped me better understand how I can incorporate my meditation practice into my journey of healing, recovery, wellness and personal growth. As always, Tara speaks with deep sincerity, and her compassion, kindness, and love shine through in the humorous and often personal stories that she uses to illustrate her points. Although the title might cause you to think that this will be an impersonal and clinical presentation that is not so. Tara's presentation carries all of the personal, calm, soothing and spiritual warmth that I find present in her other recordings. I don't know if this was intentional to help the therapists internalize what she was saying in a deeper way, or if this is just how Tara is all the time. I like to think a bit of both but more of the latter. This is a recording that I highly recommend for anyone with a regular meditation practice who is on a healing journey and has reached a point where they want to know more about how meditation might help them. I would also recommend this to someone who is skeptical about incorporating meditation into their healing, but who has some understanding of therapy and is seeking direction. For such people, Tara does an excellent job of framing meditation in terms of western medical knowledge and in the context of western psychotherapy. This is not a recording for those seeking to start a meditation practice or who are seeking immediate guidance to help them through deep suffering. There are many other recordings for such purposes, including many by Tara. I find this recording unique in that it is aimed solely at therapists, and yet is of value to a much wider audience. The sound quality is good, and I expect to listen to this recording whenever I feel a need to strengthen the connection between my meditation practice and whatever else I am doing for healing, recovery, well being, and growth.